Investors are afraid right now -- that's the message BlackRock (BLK - Get Report) CEO Larry Fink shared with analysts and market watchers on the investment management giant's second-quarter earnings call yesterday. He's right. Not only are investment fund inflows weak despite new all-time highs in the S&P 500 this month, but bearish bets (measured by total U.S. short interest) are hovering around post-2008 highs right now. Does that mean that investors should be battening down the hatches and ducking for cover before the next big market crash? Not necessarily, no. But it does mean that now's the time to get rid of any "toxic" stocks that might be lingering in the depths of your portfolio while the rest of the broad market tries to set a new high water mark this summer. To figure out which stocks to steer clear of, we're turning to the charts today for a technical look at five big stocks that could be toxic to own. 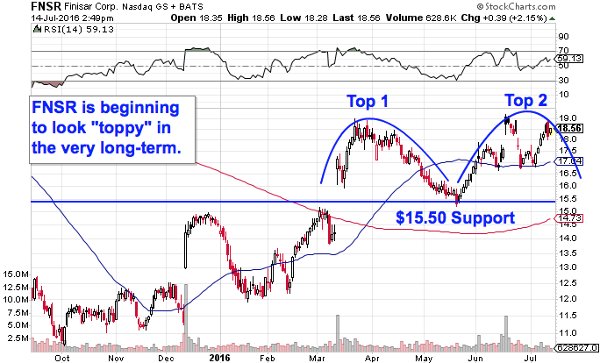 Leading off our list of potentially toxic trades is mid-cap drug stock Alnylam Pharmaceuticals (ALNY - Get Report) . So far, Alnylam has been a toxic name to own in 2016. Year-to-date, this $5 billion biotech company has lost a full 33% of its market value, trailing the rest of the market by a meaningful margin. Thing is, Alnylam could have further to fall from here. Alnylam Pharmaceuticals is currently forming a descending triangle pattern, a bearish continuation setup that's formed by horizontal support down below shares at $52.50, and downtrending resistance to the top-side. Basically as Alnylam has bounced in between those two technically important price levels, this stock has been getting squeezed closer and closer to a breakdown through our $52.50 support line. When that happens, we've got a new sell signal in Alnylam. Relative strength, which measures Alnylam Pharma's price performance versus the rest of the stock market, is another red flag to pay attention to right now. Alnylam's relative strength line has been making lower highs of its own since last summer, indicating that shares are still underperforming the S&P in the long-term. As long as that downtrend remains intact, Alnylam is likely to keep on underperforming. We're seeing the exact same price setup right now in shares of Allegiant Travel (ALGT - Get Report) . Like Alnylam, Allegiant is currently forming a descending triangle pattern after underperforming for much of the year. 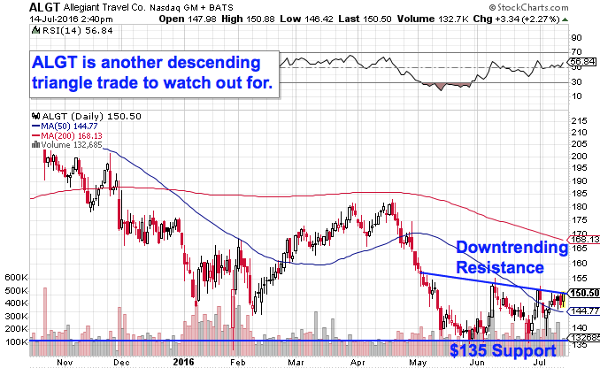 For this travel stock, the big breakdown level to watch is support down at $135. Why all of the significance at that $135 level? It all comes down to buyers and sellers. Price patterns, like this descending triangle setup in Allegiant Travel, are a good quick way to identify what's going on in the price action, but they're not the actual reason a stock is tradable. Instead, the "why" comes down to basic supply and demand for shares of the stock itself. The $135 support level in Allegiant is a place where there has been an excess of demand for shares; in other words, it's a spot where buyers have been more eager to step in and buy shares than sellers have been to take gains. That's what makes a breakdown below $135 so significant -- the move would mean that sellers are finally strong enough to absorb all of the excess demand at that price level. Buyer beware. Meanwhile, $2 billion communications equipment stock Finisar (FNSR - Get Report) has been showing investors some stellar performance lately. In the last six months, this stock has managed to rally 47%, leaving the rest of the broad market in its dust. But it might be time to think about taking some of those recent gains off the table in Finisar -- the rally is starting to show some cracks this summer. Finisar is currently forming a long-term double-top pattern, a bearish reversal setup that looks just like it sounds. The double top is formed by a pair of swing highs that top out at approximately the same price level -- the sell signal comes on a violation of the low that separates that pair of highs. For Finisar, the big breakdown level to watch is support down at $15.50. Just like any of the other potentially toxic trades we're looking at today, it's crucial to be reactionary if you're trying to figure out when to sell FNSR. Technical analysis is a risk management tool, not a crystal ball, and Finisar doesn't actually roll over into "toxic mode" until our $15.50 support line gets violated. Until then, investors should be cautious about adding onto this stock. You don't need to be an expert technical trader to figure out what's going on in shares of $77 billion biopharma firm Celgene (CELG - Get Report) . 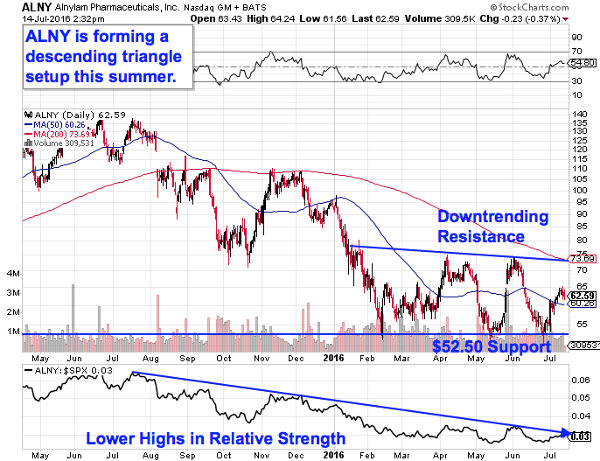 Instead, the price action in Celgene is about as simple as it gets. Celgene has been moving down and to the right in a well-defined downtrend since last summer -- and you still don't want to own this stock a year later. 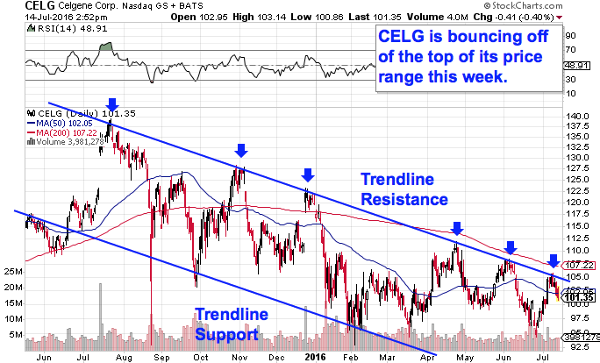 Celgene's downtrend is formed by a pair of parallel trendlines that have corralled most of this stock's price action over the course of the last 12 months. Put simply, every test of trendline resistance has given sellers their best opportunity to get out before this stock's subsequent leg lower. From here, the sell signal comes on the latest bounce lower, which is kicking off this week. Waiting for that bounce before clicking "sell" is a critical part of risk management for two big reasons: it's the spot where prices are the highest within the channel, and alternatively it's the spot where you'll get the first indication that the downtrend is ending. Remember, all trend lines do eventually break, but by actually waiting for the bounce to happen first, you're confirming that sellers are still in control before you unload shares of Celgene. Rounding out our list of potentially toxic trades is $19 billion food and meat manufacturer Hormel Foods (HRL - Get Report) . Hormel has been all over the place in 2016, a fact that this stock's 7% decline year-to-date doesn't fully reveal. But zoom out on the chart, and a more telling picture starts to show itself. Unfortunately for shareholders, it's not a good one. 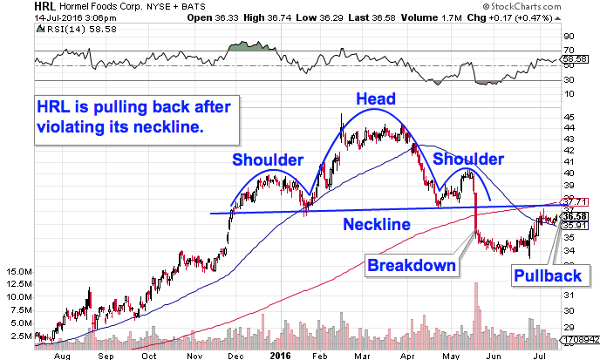 Hormel has spent most of 2016 forming a head and shoulders top, a bearish reversal setup that signals exhaustion among buyers. The head and shoulders top is formed by two swing highs that top out at approximately the same level (the shoulders), separated by a higher high (the head). The sell signal came in mid-May on a move through Hormel's neckline at $38. Since then, shares have been clawing their way back toward that $38 level - but don't mistake that recent rebound for a good thing. Instead, what we're seeing in Hormel is a "pullback," a retracement that typically comes after a big down-move. The pullback on Hormel's chart is this stock's chance to re-test newfound resistance at $38, but more often than not, it resolves itself with a retest of prior lows (in this case at $34). That's good reason to stay away from Hormel until this stock is able to show traders some evidence that it's broken free of its toxic price action.